Twill work pants from Dickies and Carhartt including the most popular Dickies 874 work pant in every size and color available.. Cargo pocket and cellphone pocket styles from Dickies and Carhartt. Flat front and pleated front styles from Dickies and Wrangler. Double knee, wide leg, relaxed fit, slim or loose fit styles also available. Inseams to 38 and waist sizes from 26-72. Dickies industrial work pants offer hemmed and unhemmed lengths in a wide range of waist sizes for that hard to find fit. Regular fit twill work pant with button front close and tunnel belt loops. 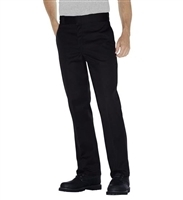 Dickies Industrial Flat Front Adjustable Waist Pants are comfortable and available in many sizes. Dickies cargo pants have pleated cargo pockets and a relaxed fit. Available in 4 colors. Skinny straight fit with double knees, cellphone pocket on leg, and logo label on knee. Dickies Slim Fit Taper Leg Twill Work Pant The same quality and features as the 874 pant with a lower rise and a slim straight fit. Dickies Regular Fit - Straight Leg Twill Cargo Pant w/ flex fabric This is the same as the best-selling pant with an extra cell phone pocket on the leg. Flat front poly/cotton blend. Two front pockets.Two rear pockets with button close on left side hook & eye closure.